For this recipe, Jade used a mixture of Ovation grass-fed lamb hindshanks and foreshanks (3 foreshanks and 2 hindshanks). Since you’re braising the meat until it falls from the bone, the type of shank you use isn’t essential. You can use only hindshanks, only foreshanks, or a mix like Jade did. Preheat the oven to 400 degrees. Prick the potatoes all over with a fork and set the potatoes on a wire rack set on a baking sheet. Bake for 45 minutes to 1 hour until the potatoes are tender enough to easily pierce with a knife. Heat the oil in a large pot or Dutch oven over medium-high heat. Working in batches, sear the shanks on all sides until browned. Reduce the heat to medium and add the carrot, onion and celery to the pot. Cook for 5-8 minutes until soft and translucent. Add the tomato paste and cook until the veggies are coated and the paste has darkened to a brick red color. Stir constantly to avoid scorching. Add red wine, tomato sauce and red wine vinegar. Stir to combine. Add the shanks back to the pot, making sure each piece is submerged in the liquid. Once the mixture reaches a simmer, reduce the heat to low, cover and braise until the meat is falling off the bones and shreds easily with a fork, about 2-3 hours. Stir every 20-30 minutes to prevent the sauce from scorching on the bottom. 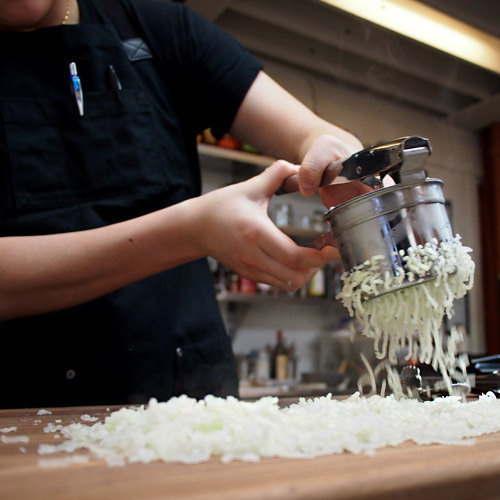 While the potatoes are still hot from the oven, working quickly one potato at a time, cut in half and scoop the potato from the skin, then pass it through a potato ricer onto your work surface. (A wide, clean portion of your countertop or a big cutting board will do.) Spread the riced potatoes evenly across the entirety of your work surface. Let the riced potatoes cool for 3-5 minutes until there’s no more steam and they are cool to the touch. Sprinkle 1 cup of flour evenly over the riced potatoes and start incorporating by gently bringing the potato-flour mixture together with your hands. Keep dusting flour over the potato-flour mixture ¼ cup at a time until the dough starts to form and is no longer sticky. Use a bench knife to divide the dough in half, and then in half again. 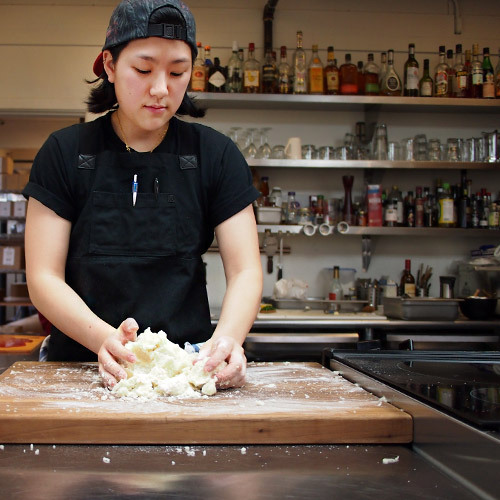 Roll each quarter portion of dough into ½-inch wide ropes and cut into 1-inch pieces. Optional: Use your thumb or index finger to roll the gnocchi over a gnocchi board or the back of a fork to create indentations for the sauce. Set the gnocchi on a flour-dusted sheet pan and set aside until the sauce is ready. Once the meat is falling off the bones and can shred easily with a fork, remove the shank bones. Shred any large pieces of meat and add salt to taste. Bring a large pot of salted water to a simmer and add the gnocchi in small batches. When the gnocchi float to the surface, cook for an additional 1-2 minutes. Use a spider strainer or slotted spoon to remove the gnocchi from the water. 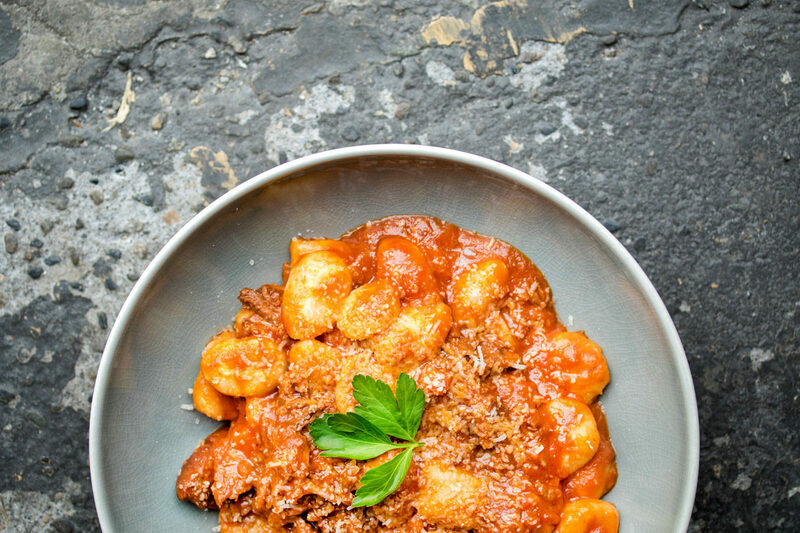 Toss the gnocchi with the lamb ragu. Top with grated cheese and garnish with fresh Italian parsley (optional). Spread the gnocchi in a single layer on a parchment paper-lined baking sheet. Transfer the frozen gnocchi to a freezer Ziploc bag. 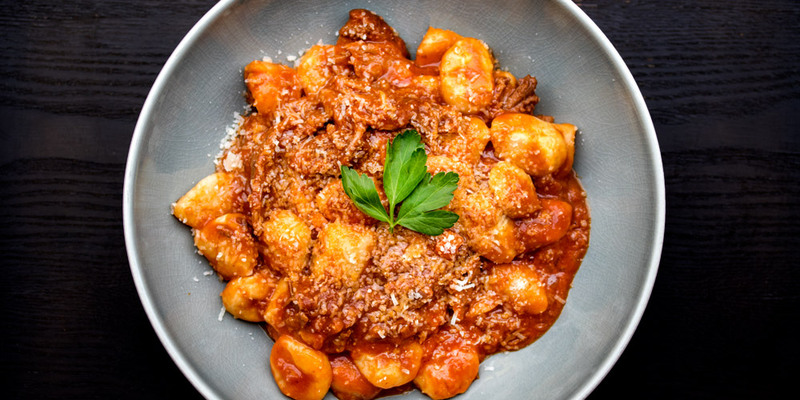 You can cook the gnocchi from frozen. It will take a few additional minutes. Simmer in water until they float, and then cook for an additional 1-2 minutes.